These daisy post stud earrings in 14K gold from Apples of Gold Jewelry are the perfect reminder of how fun stud earrings can really be! These daisy earrings are sure to brighten up your day each time you wear them, with their white rhodium center and their 14K yellow gold petals and posts. The earrings each measure between 3/8" and 7/16" (10mm) in size, and are great to wear when you want to give your day a boost of happiness. The earrings each feature push-back and post closures, which help keep them secure while being worn. 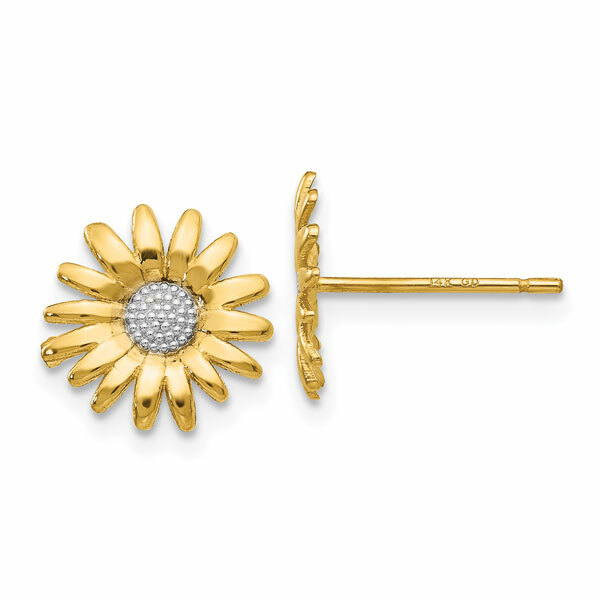 We guarantee our Daisy Post Stud Earrings, 14K Gold to be high quality, authentic jewelry, as described above.